Kenya lies astride the equator, extending from the Indian Ocean in the east to Uganda in the west and from the United Republic of Tanzania in the south to Ethiopia and Sudan in the north. On the east and north-east it borders Somalia. 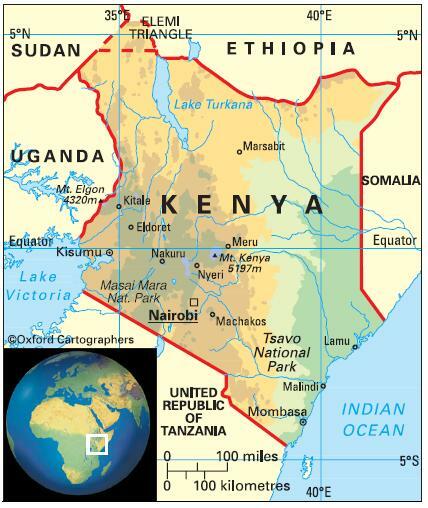 The country is divided into eight provinces (Central, Coast, Eastern, Nairobi, North-Eastern, Nyanza, Rift Valley and Western). The coastal areas are tropical, with monsoon winds. The lowlands are hot and mainly dry. The highlands are much cooler and have four seasons. Nairobi, 1,700 metres above sea level, has a mean temperature that ranges from a minimum of 13°C to a maximum of 25°C; Mombasa, on the coast, from a minimum of 23°C to a maximum of 29°C. Rainfall varies from a mean annual 150 mm at Lodwar in the north-west to 1,470 mm at Kisumu, near Lake Victoria in the west. Northern parts of the country were hit by severe floods in the latter part of 2007. The most significant issues are water pollution from urban and industrial wastes; degradation of water quality from increased use of pesticides and fertilisers; water hyacinth infestation in Lake Victoria; deforestation; soil erosion; desertification; and poaching. 43,178,000 (2012); 24 per cent of people live in urban areas and nine per cent in urban agglomerations of more than a million people. The population growth rate stood at 2.8 per cent p.a. between the years of 1990 and 2012. In 2012 the birth rate was 36 per 1,000 people (51 in 1970) and life expectancy was 61 years (52 in 1970 and 60 in 1990). Kenya is classified as a low-income economy by the World Bank.